Have you ever struggled to engage your child in his or her math homework? Kids can feel bogged down by their workload, making motivation to learn difficult regardless of how important the skills are to hone. Here, we have compiled a list of 10 math games kids can play for free online to practice essential skills they will need to succeed in school and in the real world. In this game, students are asked to click on the numbers in the colored boxes that, once added or subtracted, make the number in the white bubble (later levels involve multiplication and division as well). For example, to make the “1” here, students could either click on a single box that contains “1”, or they could click on a box that contains a “2” and then a “-1”. This game is fun and fast-paced, but it also reinforces the foundational skill of how to conduct basic operations (addition, subtraction, multiplication, and division) and how to think algebraically, both essential to understanding upper-level mathematical concepts. Parents may recognize the general format of this game as being similar to the classic arcade game Snake. In “Adders,” students maneuver the snake around the screen, avoiding the edges of the playing area as well as the brick walls and irrelevant numbers. The snake freezes for a moment, allowing students to see the problem they have to solve at the bottom of the screen. Here, the problem is “4 + 8 =”. Students solve the problem, then find the solution on the screen. Be careful! If you hit the incorrect “5” box before reaching the correct “12” box, you will lose a life. Somewhat similar to the game above, this also enforces necessary concepts of basic operations, with an added element of refining motor control. The fast-paced, interactive nature of this game will keep students engaged and having fun. “Math Lines” asks students to quickly and strategically pair together numbers that will add to 10. Students aim the number cannon at the number they wish to pair, and if it adds to 10, they destroy both balls. If it does not, the ball fired is added to the line slowly creeping toward a loss on that level. Unlike the previous games, this one focuses specifically on adding to 10 which is an extremely useful skill to have to promote quick addition when students begin adding long sets of numbers (e.g., 3 + 8 + 7 + 4 + 2 + 6 + 9 goes quickly if you pair off the tens first and add the 9 after). Part Part Whole is a similar concept to Math Lines, but this one is even tougher. Here, students must make pairs that add up to 100. The first round sticks to multiples of 5, but the game gets tougher as more difficult pairs have to be made, as pictured above. If students are bored with making pairs of 10, this is a great next step. It helps to reinforce the foundational skill of adding two 2-digit numbers, and the coordination and speed required to complete each level make it a challenge for all students. 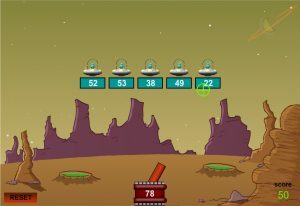 Sling Shot is a short, space-themed game in which students must solve the problem located in the upper left corner by flinging an alien through the appropriate answer bubble while avoiding the red meteors and bouncing off the green ones. They must take care to avoid incorrect answers because they lose the game after five mistakes. This game enforces foundational skills of timing and adding or subtracting quickly. It is very engaging, and the short rounds will keep even the most fidgety child entertained. Division Derby is great way to reinforce your child’s division skills. However, this game involves the student playing online with other students, so parental supervision may be necessary. The student chooses a username and the color of his or her horse, then enters into a derby with other players. Each correct answer to the division problem presented gives your horse a boost of speed, and problems range in difficulty. Students can even print off a trophy if they place in the top three at the end of the race. This game is a fun way to practice the foundational skill of quick division and helps students to memorize these division facts. Snow Sprint is a similar racing-type game as Division Derby above, but this game requires multiplication of fractions. Again, students will be competing against other online players in a race to solve fractions. This game requires not only the multiplication of numerators and denominations, but also enforces the foundational skill of needing to reduce fractions to their simplest form. As before, each correct answer gives your snowmobile a speed boost, and printable trophies are available for placing in the race. Meteor Multiplication is an excellent game for practicing speedy multiplication. Students are given multiplication facts in the form of meteors heading for their laser. They must shoot the answer they have at the appropriate meteor to destroy it before it contacts them. Not only does this game help solidify the memorization of multiplication facts, but it can also be utilized at any point in a students’ learning of multiplication. The game allows for customization in the range of the multiplication facts given, so students just starting out could choose to only see a 1-6 multiplication table, and students trying to stretch their abilities could choose 1-20. Space Fractions provides a great practice platform for any student who is just starting out with fractions. The bar in the upper left corner gives a visual of the fraction, and students have to click on the fuel canister with the correct corresponding fraction on it. Running into a fuel canister with an incorrect fraction on it costs a life. This game helps students visualize fractions as part of a whole, while also helping them convert that visual into a more workable number. The foundational skills with fractions built here will help to bolster students’ confidence and get them ready for more challenging problems, like Snow Spring as described above. Making Change is a great way to show students how to work with money in a very practical, yet still entertaining setting. Students are asked to help Harvey make the correct change for each customer using the least amount of coins and bills possible. There is no time limit on this, so students are free to ponder each choice for as long as they like. Once they are confident with their change, they can check to see if it is correct. The game gives tailored feedback for incorrect answers, helping the student to see their mistake rather than just realizing they did something wrong. Understanding money is, of course, an essential skill for any walk of life, so the importance of this game is clear, and the game itself is quite engaging! Are there other games you have had success with while reinforcing these crucial skills? Did you find that your children were not engaged with these games? Let us know!